Signed Tho.Ender in brown ink in the bottom right corner. Verso: Collection mark of Graf A. Czernin (Lugt 1207a) at bottom and stamped over the inscriptions; No. 51 in red chalk at top center; No 51 Thom. Ender (two indecipherable words) Wildbad Gastein" in pen and brown ink at the bottom; 42.Th.Ender in graphite at the bottom; Ansicht des Wohnhauses dr. K Hoheit des Erzherzog Johann in Gast (crossed out) Wildbad Gastein" in graphite at the bottom; 45? (one digit indecipherable) in graphite strengthened with red ink at top right; 45p in graphite strengthened with red ink at bottom right; 89 in graphite at top right. 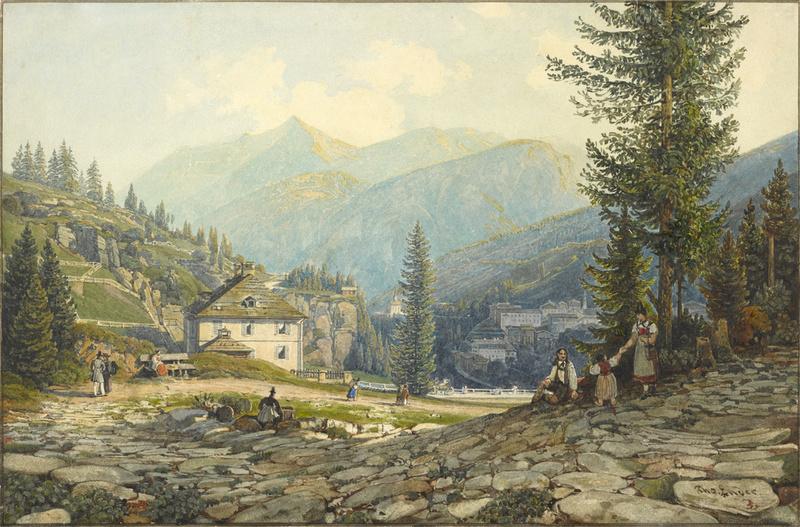 Painter to Archduke Johann (1782 - 1859)--brother of the Austrian emperor--Thomas Ender was commissioned to execute watercolors of the spectacular topography of the Austrian Alps. In this view of a mountain resort near Salzburg, the artist demonstrated a command of spatial expanse combined with effects of meticulous diminution. He delicately rendered the sublime geological elements of the Alpine landscape. With radiant images such as this one, Ender played a significant role in creating a sense of Austrian cultural identity in the decades following the dissolution of the Holy Roman Empire in 1806.